With each good deed you perform throughout the Christmas season, your Christmas Tree Angel will make its way up the tree. 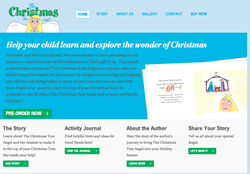 The Christmas Tree Angel is inviting users to explore their new website at http://www.thechristmastreeangel.com. Dedicated to spreading holiday cheer and encouraging acts of kindness during the Christmas season, Black Bear Design was proud to partner with them to design a custom, narrative-style e-commerce website. The concept of The Christmas Tree Angel is simple and powerful: purchase a beautiful angel to sit in your Christmas tree at home. Once your Angel arrives, name her and place her on the branches close to the bottom of the tree. With each good deed you perform throughout the Christmas season, she will move closer to the top of the tree. Can she make it to the top before Christmas morning? Of course, but only with your help through acts of generosity and kindness. Included with your purchase is The Christmas Tree Angel book, beautifully written and illustrated by the company’s founder; the Angel; and a journal to record your good deeds. The responsive site uses a customized theme, with the story of the company, the concept of the product and a full image gallery dedicated to showcasing success stories. The interactive site also includes a journal so customers can share testimonials and stories of encouragement with other potential buyers. Products will be available for purchase in January of 2015, but are available for preorder now at http://www.thechristmastreeangel.com. For more than a decade, Black Bear Design has been delivering stunning graphic design, corporate identity, web design and development of websites for a wide range of B2B and B2C clients. Black Bear’s web, graphic design and marketing expertise spans all aspects of online business, including e-commerce, retail, manufacturing, communications, professional services, real estate, mortgage and non-profit industries.